Ticket to Ride Pocket (for iPhone and iPod Touch) and Ticket to Ride for iPad have both been nominated for the Pocket Gamer Readers’ Choice Awards in their respective categories – and through the end of March, you can help us win these coveted distinctions by casting your vote for them! 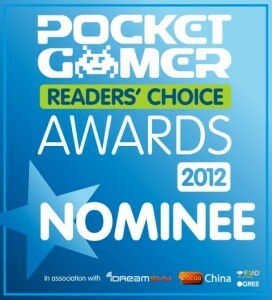 To make sure your vote is counted, visit the Pocket Gamer Readers’ Choice Awards page. Ticket to Ride Pocket is nominated in the iPhone/iPod Touch category and Ticket to Ride for iPad is exactly where you would expect it – in the iPad category. So if you love what we’ve done with these games this far, and want to see more of it in the future, go ahead and vote – Let your voice be heard! This entry was posted on Saturday, March 24th, 2012 at 09:04 and is filed under Days of Wonder Online, Miscellaneous, Ticket to Ride. You can follow any responses to this entry through the RSS 2.0 feed. Both comments and pings are currently closed. How about TTR, Small World, etc… for Android products? You will get my vote when it’s out on Android, and no sooner. Why would you withhold your vote for this game in the iPhone and iPad category until it’s available in the Android category?! I would think that if you voted for it in the iPhone and iPad category and helped the game win…it would make DoW more likely to expand into other fields! Seems to me like DoW is only interested in getting people interested enough in their products to buy the full versions. I wouldn’t expect many more software updates to existing games. There hasn’t been an update to Small World for iPad since 2010. I really like your games, just wish there were more expansions and features! Don’t forget that the Days of Wonder crew is a small one, with a lot of projects on their plates. I believe they will be updating Small World eventually…but this isn’t about Small World, it’s about Ticket to Ride, a game that has received lots of updates since it’s been released!